Druidry | The Pagan & the Pen ~ An Online Magazine! Recently I was in Norway to present at the International Association for the Psychology of Religion. 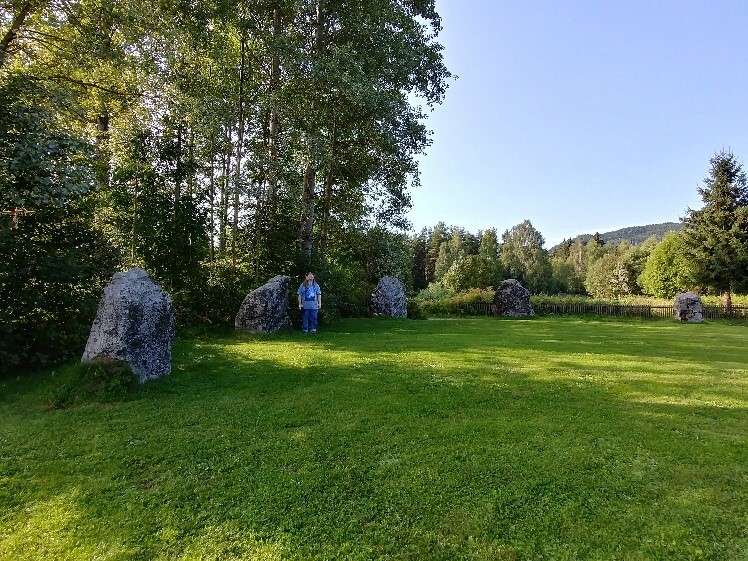 I was delighted to discover that Norway has stone circles! 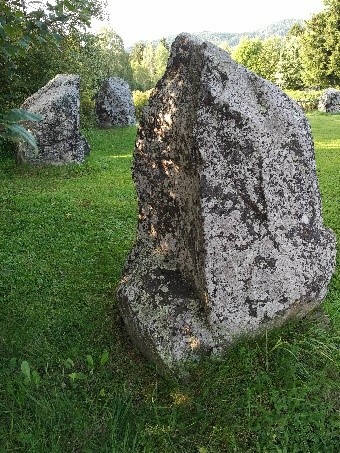 My conference was near a ring of 12 stones (named Tolvesteinringen) on the eastern shores of Lake Mjølsa. 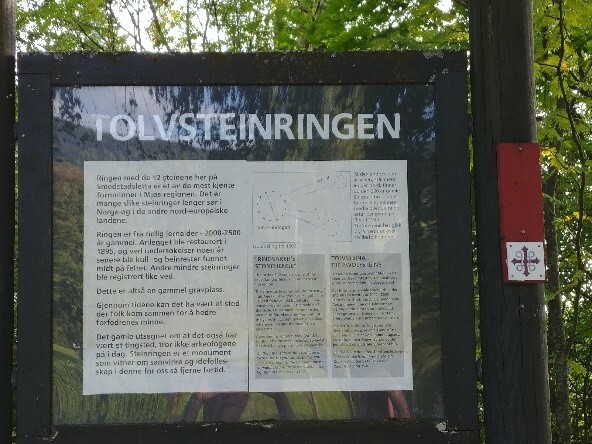 The circle is located on an easy 2 km walk north of the small town of Moelv, in Hedmark County. Beautifully preserved, it is 25 meters in diameter. Not much is known about the circle other than it dates to the Iron Age (2000-2500 years ago). Archaeologists did find a skeleton buried in the centre. After my wife and daughter took their snaps, they headed back to town while I felt drawn to spend more time with the stones. OBOD and Shamanic training are excellent for knowing on how to approach a site like this. I thus knew how to address the spirits of place, and each of the stones. I spent 2 hours there. I ended my time with a 20-minute breath meditation before heading back to my family. I left feeling deeply relaxed and blessed to have had such an encounter. Present Day Pagan Holiday: Day of the Lord and the Lady of the Sidhe — Otherworldly aspects of the Divine. FROM the earliest ages the world has believed in the existence of a race midway between the angel and man, gifted with power to exercise a strange mysterious influence over human destiny. The Persians called this mystic race Peris; the Egyptians and the Greeks named them demons, not as evil, but as mysterious allies of man, invisible though ever present; capable of kind acts but implacable if offended. 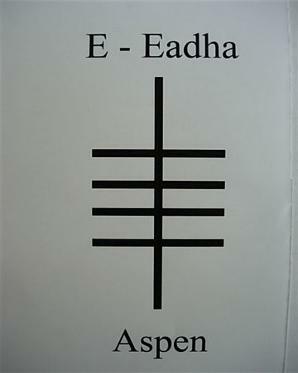 Ancient Calendar shows an observance to Cú Chulainn, today, who happened to be an Irish born Hero. Ireland, land of the forty shades of green, offers us a wealth of unforgettable Legends and Lore. If you have never looked into it’s past, maybe today’s calendar will inspire you to do so. Cú Chulainn was born of a God and mortal woman. His father was Lugh, who many said Cú Chulainn was the reincarnation of. His mother was, Deichtine. She was the sister of King Conchorbar Mac Nessa. It is said that a Druid prophesied that Cú Chulainn would be a great warrior (beginning at seven) and would be famous until the ends of time even though his time to walk in this earth would be short. Battle after battle, the Druid did not lie, until Cú Chulainn met his end only after a Queen conspired with all of his enemies in order to bring him down. Over fields and meadows and away. And your light to darkness yields. Ivy is the tree of resurrection. It’s god is Bran, in another of his aspects. Ivy is evergreen. It grows spirally, as the spiral of life grows, and represents the ever-flowing life-force that courses through the Earth. It is often the tree of chthonic (underworld) gods like Dionysios. For the Celts this is Bran. Bran is one of the father-figure gods and a giant. It is told that when he lay down over a river, an army could march across him. He is also king of the underworld, and watches over the treasures of Don. These treasures are the animals, plants, insects, birds and the fabric of life itself of the Earth, for Don is one of the names of The Mother. So Bran is a king in the Celtic sense in that he was guardian to and of the goddess. He is also the God of Bards. It seems that again Christianity homogenized one of the Celtic gods. Most conquering peoples do this to some extent, some are reasonably gentle about it as the Romans were in integrating their gods with ours. Others are brutal as were the Christians. Bran is associated with the Apple Isle, Avalon, and one of the places his head is said to be buried is there. There are many candidates for Avalon in the real world and, as I’ve said before, chasing down which is the “right” one is a fool’s game. I have personal reasons for favouring the island of Lundy off the North Devon coast as it’s where I was born and grew up. It is said there are towers, usually invisible, on the island and that in one of these Bran’s head his buried. The towers are also associated with Arianrhod, and with Elen of the Ways, my personal patron. The old name for Lundy was ‘Ynys Wair’ – Gwair’s Island. Gwair is a Celtic – Sun God. The 19th century Celtic scholar, Professor Rhys, was among the first to connect the imprisonment of Gwair on Lundy, with the Greek myth of the binding of Chronus on a western isle. What is this myth of the god imprisoned on a western isle? In the Book of Taliesin the poem the Prieddeu Annwyn – The Spoils of Annwn – contains the outline of the now lost legendary tale. The poet tells of Arthur and his men sailing to the Fairy Fortress ,Caer Sidi, aboard Arthur‘s ship Prydwen to free the captive Gwair. It is accepted by leading scholars in the field that the Fairy Fortress, Caer Sidi, refers to the island of Lundy. So … the sun is captured and imprisoned in the west, the place of sunset. The Celts had less fear of the dark than of the sun who was said to burn the land and called the “son of Scorch”. Pwyll fights him for Arawn as part of their agreement. The taking and keeping of the sun is part of Bran’s ritual each midwinter. He is the Ivy god who fights with the Holly god – as sung in the Christmas carols – and who is overcome. It is an alchemical battle between death and resurrection. The battle is also told of in the tales and songs of the Robin and the Wren. Tradition was that the wren is killed on the 26th December – the first day after Sun-Return, the day the sun begins moving again after the midwinter solstice or standstill, when there begins to be more light than dark each day for the next six months up until midsummer. In ancient times Sun-Return was a very special feast, not because our ancestors were stupid and thought the sun would never come back but because they were wise and knew to work with and celebrate the goddess in the seasons. Graves likens this time to the autumn feast of Dionysios, called the mysterion. 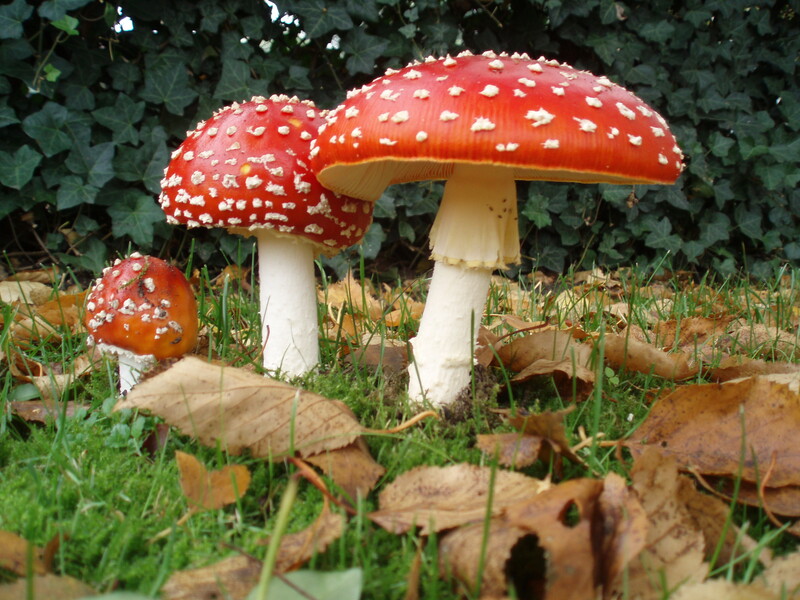 As well as wine the celebrants would have taken the faery toadstool, amanita muscaria, the red toadstool with the white spots in all the faery paintings. It’s quite possible this was done in Celtic lands too. The journey given by the toadstool is deep, passionate and violent, it strips to the core, tearing us apart. And note we call it a “toad stool”, place of the toad, the alchemical creature whose poison can be made into a medicine, rather than a mushroom. The feast is called the mysterion … feast of the mysteries, the lore, the grammarye, the reality of Life. As part of this ritual ivy-ale, a highly intoxicating drink, would be drunk. It was still brewed at Trinity College, Oxford, up to the 1960s and maybe still is. The ivy bush was an old sign of a wine, as opposed to beer, tavern in England. There are still many pubs called “The Ivy Bush”. In British folklore, Ivy is a bringer of good fortune, particularly to women. Allowing it to creep up the walls of your home protects all who live there from baneful magic and curses. It also appears in love-divination, it was said that a girl carrying Ivy in her pockets would soon see the young man who was meant to be her husband. Medicinally, an Ivy tonic can be brewed to keep away diseases such as whooping cough and respiratory ailments — it was even believed to keep away the plague. The Fisher King appears first in Chrétien de Troyes‘ Perceval, but the character’s roots lie in Celtic mythology in the figure of Bran the Blessed in the Mabinogion. Bran had a cauldron that could resurrect the dead that he gave to the king of Ireland as a wedding gift when the king married Bran’s sister, Branwen. Later, when Branwen is insulted, Bran wages war on the Irish and is wounded in the foot or leg, the cauldron is destroyed. He asks his followers to sever his head and take it back to Britain, and his head continues talking and keeps them company on their trip. This story has analogues in two other important Welsh texts: the Mabinogion tale Culhwch and Olwen, in which King Arthur‘s men must travel to Ireland to retrieve a magical cauldron, and the obscure poem The Spoils of Annwn, which speaks of a similar mystical cauldron sought by Arthur in the otherworldly land of Annwn. The purpose of the fishing has got very lost over the hundreds of years. Going back into the Celtic original we can link it to the Salmon of Wisdom. To catch this Elder Beast and ask it for advice was a known way to help with ill-fortune and the Fisher King would do this. Indeed, it would be one of kingly duties both to ensure the nine hazel trees surrounding the Well of Segais flourish and so provide nuts to feed the Salmon. Also to go to the Well and call the Salmon, ask it to come and answer questions. In Celtic terms the gaining of wisdom is often about “eating”. To digest and absorb, right into ones bones so to speak, is considered good learning. Just to process it through the head, the brain, was and is still considered worthless and ineffectual. So the Fisher King would catch and cook and eat the Salmon. And, every time, the Salmon would renew itself, come again into form so that it can provide the wisdom-food for the next supplicant. As you work with ivy don’t go eating it, it’s very poisonous! But do sit with it, try to absorb its wisdom within you. 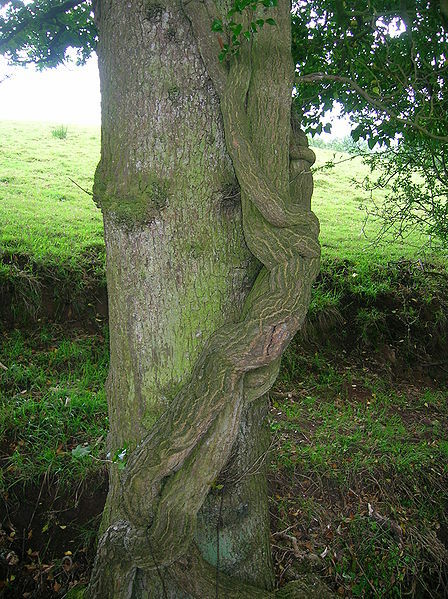 Don’t try to make sense of it just flow, with it, allow it to wrap around you, embrace you, as ivy does the tree. And don’t be afraid, although ivy is a parasitic plant it never kills its host – that would be stupid and wasteful as it would lose its means of support. Ivy gives as well as receives and will teach you how to do this too. As a resurrection plant, ivy will take you through each little death that happens in your life and help you enable yourself to rise again. You will be a larger and more inclusive being for the experience. The shield-maker’s tree. Tree of old age. Elders, wizards, cunning men. A major characteristic of the tree, Poplar, is that she is always moving. The slightest whisper of wind set her to rustling, we have two outside out bedroom window and the whisper to each other all the time. To dance, to always be moving, is a way of defence, of shielding, and a way of being invisible. Dancing gods are known all over the world – Shiva, Krishna from the east are quite well known, for instance. This is another form of shielding to consider. The Latin name of the aspen is Populus tremula, the trembling poplar. 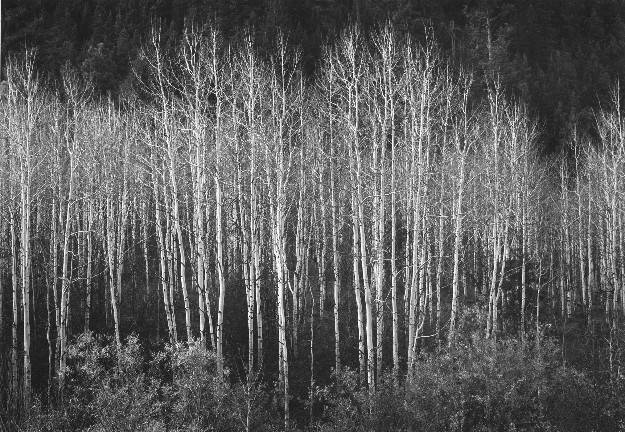 Though other poplars have a similar habit of shimmering in the breeze, the aspen’s distinctive canopy of round leaves with serrated edges and pale undersides, mounted on long, laterally flattened stalks gives the tree the unique appearance of shimmering or quivering in the wind. They also make a distinctive rustling, whispering sound “. . . as if they were spattered by rain.” (R. Mabey, Flora Britannica 1996). Many traditions associate the wind with the voice of Spirit. The moving, rustling whispering of the polar can give you this if you sit still with it and listen. The shadows the ever-moving leaves cast on the ground gives a flickering landscape to stand in, it is like standing between the worlds … at the interface where all worlds meet. The movement of the shadows can be your journey-horse, transporting you to otherworld if you allow it. Aspen crowns have been found in ancient burial mounds. It may be that this ability to transport is part of ther reason for this, transporting the spirit across the threshold from Thisworld to Otherworld. The word “aspen” comes from the Greek Aspis meaning shield. The Celts used this light wood for making their shields, combining the physical wood with the spirit properties of the tree to ward off enemies. It is called the “shield tree”. The Scottish Gaelic name is critheann (pronounced cree-an), the Gaelic verb for tremble is crith. As with Thomas the Rhymer, an aspen leaf placed under the tongue would make the bearer more eloquent, traditionally a gift of the Faerie Queen. Highland folk taboos say the wood must not be used for fishing or agricultural implements, or in house construction, which makes the poplar a faerie tree on a par with the rowan. Unfortunately, Christianity had a go at trees, along with all things Faerie, making them evil. 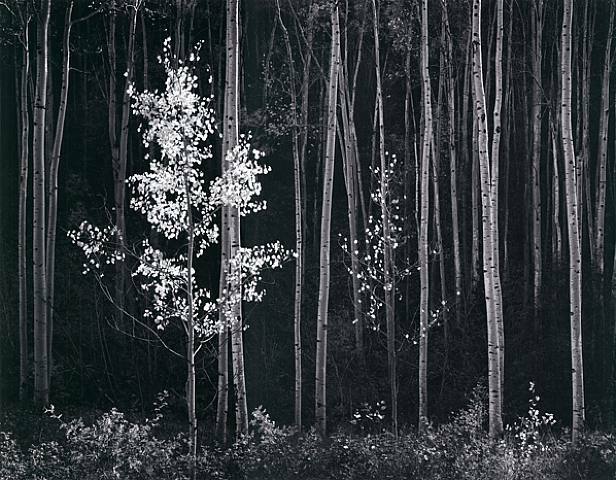 In this case the shimmering aspen tree was said to tremble in shame because its the wood made the crucifixion cross was made. Other Christian tales give the same accusation to holly and oak. All these trees came to suffer fear and loathing because of this. The Bach Flower Remedies aspen is used to treat fears and apprehensions. All of these ideas suggest forms of “shielding”. So what is shielding, what is a shield? This is much more than just a piece of wood between you and your foe’s sword. Perhaps one of the most important concepts here is that of boundary. In order to effect any of the suggested actions there must be a boundary, a distinction between self and not-self. If you do not know what is you and what is not-you, what is your flesh and what is the wooden shield, or the enemy’s sword, then you haven’t a snowball’s chance in hell of escaping being cut down in battle. 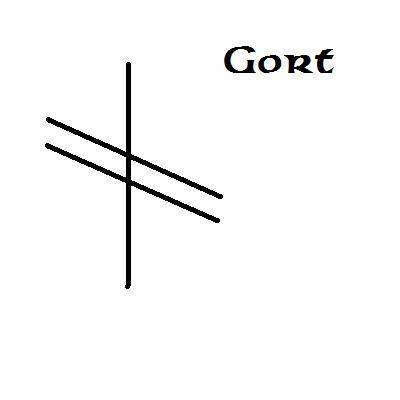 So, the goddess’ watch-words for this season, and this vowel-sound, is about knowing self. To know yourself, and to know otherness as the other side of that coin, is to provide a shield for your head. The thesaurus offers us these as some possible interpretations of the concept of elder. Some folk think that they can call themselves elders, even that they may get a certificate that calls them such … this is all pie in the sky. You can indeed come to know yourself to be an elder but by that time you won’t have the slightest inclination to talk about it. You know far too well that, although you know a great deal and have much experience there is a great ocean of knowing and wisdom out there – as Isaac Newton (alchemist) put it – that makes your knowing only the size of a tiny pebble on the beach. Elders are known to their people, or some of them at least. Again, the elder has the supreme confidence of self-knowing that means they do not mind if the whole world is against them. What are the advantages of this? If no-one and nothing can undermine you then you are not blackmail-able. You cannot be cowed into agreeing with someone/thing when you know it is wrong, you cannot condone wrong actions, you cannot collude. Do you see the advantages of this? What if no-one could force you to do something that you knew was wrong, they had no hold over you, there was no peer pressure, no need in you to be a part of the group, no fear of being ostracised? Is this not what governments fear? A population that they cannot cow? A population that will say, ‘Oh come off it! Show us your rabbit!’? Come to that … how much do you fear being left out, being ostracised, excluded? Mmm … more difficult to admit to ??? Then sit under poplar, watch the shadows flicker through the many realities, allow poplar to transport you to worlds where you can be true to yourself. Then … learn how to carry this knowing back across the worlds so that you can BE it here, in Thisworld. Wizard = wyze-ard, wise one, one who has absorbed wisdom. The wizard has done this. No, not just the Harry Potter version although he does make a fairly serious attempt to do this. But the real wizards have done this, go and look up the stories about some of them, the most famous British one is, of course, Merlin. Read about him with open eyes. Remember he is only half mortal. Realise that many storytellers dumb down the tales to fit them to the ears of their audience and so collect more pennies in their hat and more kudos for their tellings. Consider too if the storytellers really had much concept of the magnitude of Otherworld … many don’t but try to reduce it all to human-size. To absorb wisdom is hard work … like eating and surviving the poisoned apples as Merlin does in the Caledon forest. It also means getting a very real picture of yourself and you place in the scheme of things. In general human perceptions seem to go wide of the mark, either to large … we were all Cleopatra or Napoleon in our past lives rather than the slave who emptied the chamber pot! Or too small in that we believe we can’t do anything and are continually saying we must wait until the time is right, the moon in the right quarter, etc … waiting for the eternal “round tooit” and, as we all know, these are in extremely short supply! The wizard does not wait but gets on with it, gets on with the next job. The Zen adage to eat your rice, then wash your bowl is a good example of this. The tenet of how to gain wisdom is known worldwide but it has little Hollywood appeal so most people don’t go there. Steiner said (rightly) that good spirituality is eminently practical and was always exhorting his followers with, “The deeds, gentlemen, the deeds!’. Deeds, doing and not doing them, and knowing when is appropriate – as the elder does – is wisdom. Again, in order to be any of these you must know yourself. You cannot work magic if you are muddled as to what you are working it on, where you are working it, what it will effect. Well, you can … but it will end up like Mickey Mouse and the Mops in the film Fantasia! And you will need a skilful, adept wizard to rescue you before you drown! In the British language the name Cunningham comes from “cunning man”. This picture of a cunning woman from the Boscastle Museum of Witchcraft shows such a person. The link, to Wiki, gives a good outline of them. I favour historian Emma Wilby’s description to the (perhaps) better known Ronald Hutton’s – he too often, for me, explains away and also tends to denigrate those who don’t follow his own spiritual path. Emma Wilby identified what she believed were a number of shamanic elements to the magic of many cunning folk. For more about her work look here. The cunning folk of Britain worked with familiar spirits – the witch trials testify to this where cats were hanged and burned alive along with their mistresses. The natural world was no enemy but a friend and ally … a shield for the head. Nowadays people tend to fear the world, nature, that which is not human – see daft TV programmes called such things as “Dangerous Planet”! There is a specially human sort of arrogance that believes the world is out to get them – as though we were that important, instead of the most junior in age as well as intelligence of all the animal species that in habit Mother Earth. The ways of nature were and are still open to the cunning folk. It is part of the ability to “work with” rather than the need to control, to defeat, to overcome … all words much more often used in modern society. Again there is that stupid arrogance that we might be able to overcome the planet. Oh yes, we can make her life hell, make her creatures extinct, but in the end we will die and she will recover … possibly having decided not to make the mistake of letting humans aboard her again. The cunning folk are skilled in many ways but perhaps most in their ability to discern what action is appropriate for the time and place where they are at that moment. They are resourceful and ingenious in being able to change that mode of being, acting, as soon as they perceive that it is no longer appropriate. They are creative and inventive in the ways they find to change, again suiting means to need. They are adroit in being at the right time and place and dextrous in how they handle situations, people and spirits. They have ability. All this comes from that initial knowing of self … which may take a long, long time to learn. Poplar as AllyPoplar is an ally, a great ally. Allies are those who help and befriend us. Like the cunning folk, you too can discover this and poplar will help. These are some of the Thesaurus’ offerings for the word ally and all are well worth pondering on. How do you find each of theses word-concepts? How do they in-form and enlarge your idea of “ally”? Take all of this into your pondering for the time Eadha, the poplar month and consider how “I am the shield for every head” is true. 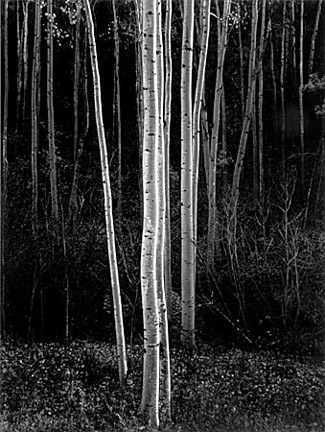 The pictures I’ve used this time are from the wonderful photographer Ansel Adams; he had a way with aspens that gives the magical feel of the tree. And 52 pages with numbers to call? Showing cardinal points, the elements and all? Of those just born and those who died. Another wrinkle in my face. And like a secret sold. A woman, young and old. I see that I’m the year, that I am life.